Cacio & Pere | Just Visit Siena ! Since Wednesday afternoon only rain in Toscana. . .without stop. So it is not the best time to do sightseeing or take some pictures. However you can if you want, the only thing . . . don’t forget to take big umbrella! That is why I want to suggest you very casual restaurant today . . . Cacio & Pere. You will find it in the heart of our historic center. For sure you will be satisfied with the inside of the restaurant. That is warm atmosphere, local live music, long selection of wines (from the most famous Tuscan red wines, Brunello di Montalcino, Chianti Classico and Morellino di Scansano, until the whites whose offer also includes labels from Friuli, Sicily and Trentino), cocktails, lunches as well as very polite staff. 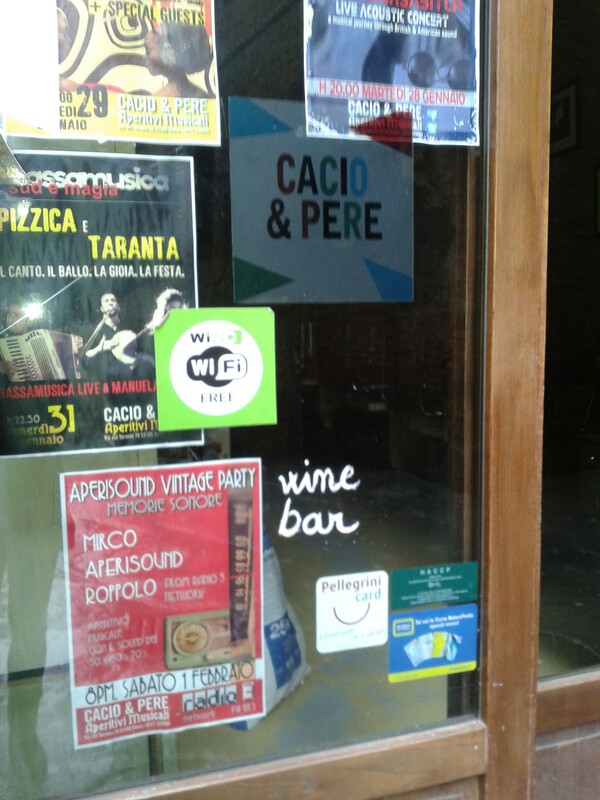 What is more during the weekend’s evenings Cacio & Pere is full inside and outside. A lot of people stay outside drinking, talking with friends and smoking. Just here are served cold or hot dishes of the traditional cuisine of Siena that with wines and beers taste great. You can try many delicacies of traditional Tuscan bruschetta, pappa al pomodoro, more or less ripened cheeses, salamis and hams produced by local companies. And what is more everything for all budgets. Downstairs part of the local hosts live bands every night and exhibitions of paintings and photography of young talent. As you can see this adorable place has everything that makes it special and worth to visit! Hmm what you need more . . . ? I guess only the address . . .Via dei termini 70. So wish you a nice evening and weekend !